In each of my posts, I include links to resources specific to that topic. On this page, I’ve collected some resources I use again and again because they’re full of great information on a wide variety of topics. Within each section, they are listed in a purely subjective order, where I list my very favorite resources first. But all of the resources on this page come highly recommended! Tinkerlab: A Hands-On Guide for Little Inventors by Doorley. My review. The Curious Kid’s Science Book: 100+ Creative Hands-On Activities for Ages 4-8 by Citro. My review. Big Science for Little People: 52 Activities to Help You and Your Child Discover the Wonders of Science by Brunelle. My review. The 101 Coolest Simple Science Experiments: Awesome Things To Do With Your Parents, Babysitters… by Homer and Miller. My review. Picture-Perfect STEM Lessons, K 2: Using Children s Books to Inspire STEM Learning by Morgan. Yes, they’re pricey, and yes, they’re worth it if you’re planning/teaching STEM classes to kids. Each chapter includes recommendations for two kids’ books AND a full curriculum built around those books: crafts, games, circle time discussions, worksheets and more! Just using them to see what books they recommend on any given topic is worth it. The Kids’ Book of Simple Machines: Cool Projects & Activities that Make Science Fun! by Doudna. (Also The Kid’s Book of Simple Everyday Science ) My Review. Kitchen Science Lab for Kids: 52 Family Friendly Experiments from Around the House by Heinecke. Energy Lab for Kids: 40 Exciting Experiments to Explore, Create, Harness, and Unleash Energy by Hawbaker. Growing Up Wild Activity Book: Exploring Nature with Young Children. (Distributed at their trainings.) Read my whole review of it here. The Smithsonian’s Maker Lab: 28 Super Cool Projects: Build * Invent * Create * Discover by Challoner. Any of the books recommended in Picture-Perfect STEM Lessons . (see above) Here’s a listing of the Picture Perfect Science Books. Children’s Book Council also releases a list of Best STEM Books of the year. It’s a joint project with NSTA, American Society for Engineering Education, International Technology and Engineering Educators Association. Preschool STEM Curricula from Massachusetts. Great detailed lesson plans on topics from gardening to birds, weather, and simple machines. Teacher Enrichment Resource Packets from Explorit Science Center – designed to accompany their exhibits but several ideas stand alone. STEM Resource Finder from the Concord Consortium. Interactive STEM activities for elementary through higher ed. Preschool STEM Teaching Units from Audubon in Massachusetts. Early childhood science in the outdoor classroom. These are just a few of my favorites, that I find myself going to time and again. Each of these resources has a website / blog and they have a Facebook page where you can follow what they’re up to. These links are all to the “about me” page of each site. Frugal Fun for Boys and Girls – https://frugalfun4boys.com/about/. Science Snacks from Exploratorium – exploratorium.edu/snacks/. Lemon Lime Adventures – http://lemonlimeadventures.com/. Fun At Home With Kids – funathomewithkids.com/p/new-start-here.html. Babble Dabble Do – http://babbledabbledo.com/about-bdd/. Hands On As We Grow – https://handsonaswegrow.com/about/about-us/. What We Do All Day- whatdowedoallday.com/aboutcontact/. Steve Spangler Science – stevespanglerscience.com/lab/experiments/. STEAM Powered Family – https://www.steampoweredfamily.com/about/. Club Tinkerlab on Facebook is a large group of parents, educators, and librarians who post questions about topics related to teaching STEM to kids, and always get great advice in response. What favorites of yours have I missed? Sid the Science Kid is absolutely fabulous for teaching STEM concepts to preschoolers!! It’s set in Sid’s home and preschool with lots of relatable characters, a predictable structure to each episode and a definite talent for simplifying concepts for this age group. Bill Nye the Science Guy. Just search YouTube for his “full episodes” or buy DVD’s . This is more aimed at 8 – 12 year olds, I think, but my 5 year old loves it and learns from it. PBS’s current line-up includes: Bob the Builder (age 3+, tools and construction), Cat in the Hat knows a lot about that (age 4+, natural science including topics like migration and animal classification), Cyberchase (ages 5+, computers, math and the environment), Design Squad (middle school to high school, engineering and making), Dinosaur Train (age 3+, dinosaurs and paleontology), Go Jet Go (ages 4+, focus on astronomy and technology), Nature Cat (ages 3 – 8, about engaging with and developing an understanding of nature and free play outdoors), Peg + Cat (age 3 – 5, math and strategies for problem-solving), and SciGirls (ages 7+, focus on science problem solving and includes interviews with women scientists and engineers). There are several stand-out science shows from the past that are available online, either legitimate streaming or not. Dragonfly TV, Magic School Bus, Myth Busters, Little Einstein, and more. If you’re surprised to find songs on a resource list for STEM learning, then you need to read this post on Music and STEM learning or this one on Research into the Benefits of Music Lessons. These are all great for car rides. My six year old (and I) enjoy listening to them all: Brains On Science Podcast, The Show About Science, Tumble Science Podcasts, and Wow in the World from NPR. Free, fun, and educational! If you don’t already know about the delights of podcasts for kids, learn about: how to listen, where to find them, and some recommended best podcasts for kids at www.commonsensemedia.org/blog/20-podcasts-for-kids. Here is just a sampling of the STEM focused apps for kids. They’re all for kids age 4 – 7, and all rated 4 or 5 stars by Common Sense Media, which looks at age-appropriateness, educational quality, entertainment value, and how much emphasis is put on spending money on in app purchases. You can read reviews of all of them on Common Sense Media. I have added affiliate links for the ones my son (who’s almost 7) has played and enjoyed. Puzzle / maze games which apply concepts about physics: Thinkrolls, World of Goo, Cut the Rope , Where’s My Water? and Busy Water. Build/test contraptions: Inventioneers , Pettson’s Inventions Deluxe , Bad Piggies, CATS, Leonardo’s Cat. Build vehicles and tracks: Train Kit, Fiete Cars, Blaze the Monster Machines. Simple Machines: Crazy Gears, Simple Machines by Tinybot. 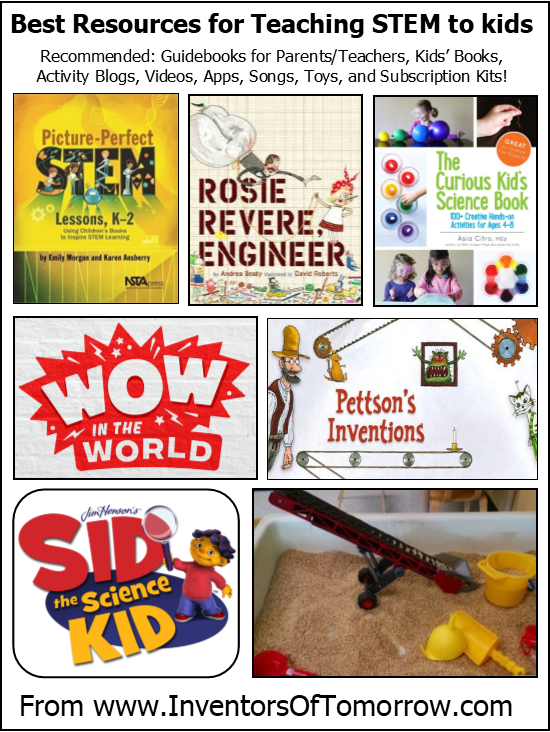 General STEM skills: Curious George Adventures in STEM, Sid’s Science Fair, Space Racers. Coding Skills: Coda Game, Code Karts, Kodable, Daisy the Dinosaur, PBS Kids Scratch Jr., Goldie Blox Adventures in Coding, The Foos. Specific Science Topics: Toca Lab Plants, DNA Play, This is my Weather – meteorology for kids, This is my spacecraft – rocket science for kids, Star Walk Kids, Apollo 11 by Bean Bag Kids, Robot Factory, Toca Lab Elements, This is My Body – anatomy for Kids, and Dinosaur Train. On a related note: do you wonder about screen time for kids? How much is too much? Is some OK? Here are my tips on finding the screen time balance that works for your family. Young Scientist Club: theyoungscientistsclub.com. Clifford the Big Red Dog Science Club for ages 3+, Magic School Bus Science Club and Young Scientists Club for ages 5 – 12. Kits provide materials, instructions / science info for adults, and instructions for kids. $19.99 per kit. Note that you can also purchase single kits on Amazon: Clifford The Big Red Dog Kits, The Magic School Bus Labs, and Young Scientist Series. Tinker Crate’s KIWI Crate kiwicrate.com/tinker. Ages 9 – 16. Detailed step-by-step instructions for one high quality project, tinker zine with directions for additional projects, video tutorials, and all the materials you need. $16.95 – 19.95 per month. Little Passports Science Expeditions, littlepassports.com. Ages 9+. Each kit includes comic book, detailed instructions for multiple experiments, and access to bonus videos online. Kits include all needed materials, even everyday items like rubber bands. $18.95 – 21.95 per month. Also, Amazon has STEM Club Toy Subscription: 8-13 year olds . This is just a curated collection of toys, where each month, they ship you a new STEM toy, often one that’s exclusive to Amazon. On this page, I include many links to help you find these resources. The links to Amazon are affiliate links, and I do get a small portion of the proceeds if you choose to purchase items after clicking on these links.